The Sharingan is one of Kekkei Genkai that naturally occurs in a select few members of the Uchiha clan. When the user is in a life-threatening situation, Sharingan usually appear to save them. Only few person that possess the Sharingan, some of them are Sasuke Uchiha, Itachi Uchiha, Kakashi Hatake, Madara Uchiha and Madara's brother. The power of the Sharingan is judged through the number of tomoe in the eye, with a maximum of three in each. The Sharingan's first level and most well known ability is to memorize any technique that it witnesses. The user pupil will turn red and develop one of the wheel swirls. It can memorize any standard form of jutsu with perfect accuracy, allowing the user to use the techniques as his own. Based on Naruto storyline it was released when Sasuke for he first time fight againt Rock Lee taijutsu. Sasuke make some copy of Lee's move and show it when he fight Akado Yoroi, even he is able to modified with his own move. The Sharingan's second level ability is granting the user incredible clarity of perception, allowing them to track fast-moving objects with ease and even predict the subsequent movements of those objects. The user pupil will turn red and develop two of the wheel swirls. This second levell was show up when Sasuke took Chunin Exam. Sasuke was able to reproduce answers on another person's test by watching their pencil movements and copying their answer. The Sharingan's third level capability is a unique brand of hypnosis that involves suggesting actions and thoughts to the opponent. The user pupil will turn red and develop three of the wheel swirls in both eyes. In this level the user can read Genjutsu, Taijutsu and Ninjutsu, learn how the skill is done and then copy it to be used later. This allows the user to perfectly mimic every move their opponent makes, even before they do, making it appear as if the user can see the future. The last level is Mangekyo Sharingan, it is a heightened form of Sharingan. 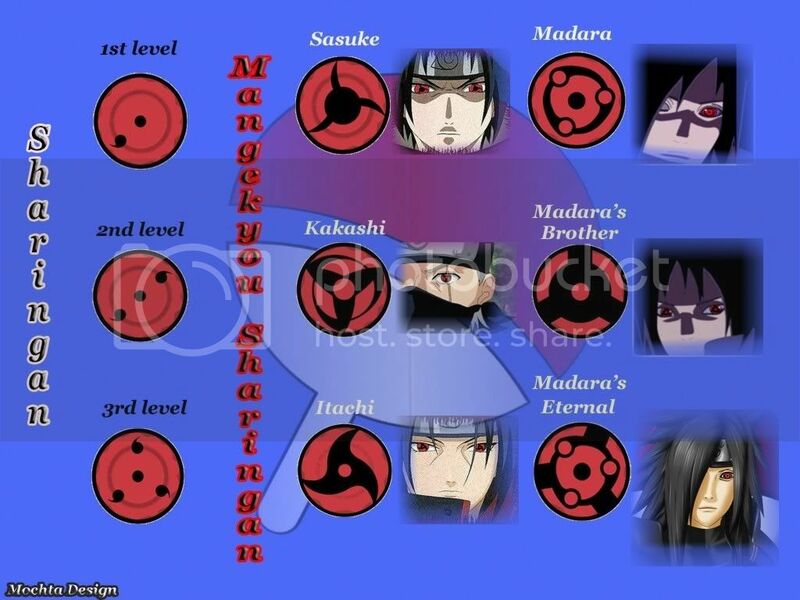 Madara Uchiha become the first person which awakened Mangekyou Sharingan. Then his brother also awakened Mangekyou Sharingan. With that power both of them be the strogest person in their clan. Mangekyou Sharingan was able to use it to gain control over the Nine-Tailed Demon Fox. After Madara and his brother only three person could do the same thing, they are Itachi Uchiha, Kakashi Hatake, and Sasuke Uchiha. Sasuke initially caught a glimpse of this version of Itachi's Mangekyou which differed from his later version. Itachi was able to finally master this form during the period he killed his clan. Itachi get this Mangekyou Sharingan after killed his closest friend. In this form Itachi is able to use the Amaterasu and Tsukuyomi Doujutsu techniques. Even Kakashi isn't from Uchiha clan, Whether this form is due to Kakashi or some inheritance from what Uchiha Obito was capable of is unknown. Using the eye, Kakashi can use a technique which appears to collapse space in around a focus point and transport it to another location. After developing the Sharingan, Madara and his younger brother trained against one another and eventually awakened their own version of the Mangekyou. The use of these eyes increased the brothers' strength and allowed them to take over leadership of the clan. Unfortunately the usage of the eyes lead Madara to lose his vision. After developing the Sharingan, both brothers trained against one another and eventually awakened their own version of the Mangekyou. The use of these eyes increased the brothers' strength and allowed them to take over leadership of the clan. But because of Madara as the lead get blindness, he give his eye into Madara. Those who possess a Mangekyo Sharingan suffer from ever-deteriorating eyesight, a process that becomes faster through repeated usage and culminates in blindness. nly by taking the eyes of a sibling can one's eyesight be permanently restored, combining the appearances of the two Mangekyo Sharingan and granting them immense strength in the process. As a result, Madara awakened a new more powerful set of eyes which allowed him to see the light once again. For you all Uchiha fans, I give you bonus, not only information about sharingan but I also made it into wallpaper. The Sharingan's Level Wallpaper, you could take this into your friendster or PC dekstop maybe, whatever, do anything you want. I hope this information is usefull for you. you are wrong about sasuke's mangaekyou.. it was like a solar system or DNA atom thing.. it wasnt the shuriken look.. he didnt have mangekyou not until he defeated his brother itachi..
he ahd taht form of mangekyu when he first saw madara/tobi's eye, then immediately tobi caught amaterasu from sasuke... thats because itachi planted that in sasuke for reasons i dont know... so 2 cut the long story short... its itachi's mangekyu form that he first used... he first used his own when he fought "killer bee/hachibi/8tails"
sasuke obtained his own mangekyou. its not a solar system kind you noob.. neither atom thing, haha.. rofl... ITS like s star but 6 sides. .
noob.....Sasuke developed both the level 1 and level 2 sharingan in the fight against Haku....he had the level 1 in his left eye and level 2 in his right eye. dude, sasuke developed his mangekyou after he defeated itachi..plus it looks like an atom not that! ! Sasuke did have a form of mangekyou when he was talking with madara, after he killed itachi. what the mangekyou that everyone saw that looks like the shuriken (one center circle with skinny lines going out, as depicted in the picture) was actually and truly itachi's very own mangekyou. you find this out after madara cought fire with amaterasu and says that itachi had one final trump card, by and i quote,"It seems that Itachi implanted his own power inside of you, the Amaterasu." this allowed sasuke to use the jutsu, but when he does, it is itachi's mangekyou sharingan that you see, because itachi gave the ability to sasuke. i hope i have cleared up some confusion about the whole sharingan issue about sasuke. i am a die hard fan of naruto and i have never seen anything like the mangekyou sharingan that everyone shows of sasuke. i actually beleive that it is someones attempt to make itachi's sharingan, only because it looks like itachi's the most, and people say it is one of sasuke's. thank you for taking the time to read my thoughts about this situation, if you want to talk about it more with me, add me as a friend on my myspace SCR3AM0 SN1P3R (the 0 in screamo is a zero). First off, Sasuke never killed Itachi. Itachi died from being sick. Second, Sasuke's Mangekyou looks like an atom. Do you guys actually watch the show or follow the manga? You can't plant the mangekyou in anyone LOL. Itachi gave Sasuke some of the ocular jutsu he knew (i.e Amatarasu). he is right lah! when he was talking to madara he used the amaterasu with that mangekyou sharingan then later when he went to capture the 8 tails he developed his latest mangekyou sharingan! but he is wrong about the first level of sharingan sasuke used it when he tried to fight his brother when itachi killed his clan ,then later he developed his second level of sharingan when he fought orochimaru in the forest of death. First off Sasuke, Gained lvl 1 when Itachi left him in the village, if you didn't know watch Naruto Shippuden Ep.142. Second he gain lvl 2 fighting Orochimaru. Then got lvl 3 fighting Naruto. Now for those of you who are getting mixed up about the damn shape of Sasuke MS, it really doesn't freakin matter. Yes at first when Sasuke woke up and saw Madara, The shape of Sasuke MS was like a shuriken, but later on fighting Killer Bee, the shape changed into an Atom. Yes I said it Atom. REMEMBER ALL STARS HAVE POINTING EDGES NOT ROUNDED ONES. Obviously some of you don't know your damn shape, anyways thats not the point, but there you have it. And quit saying Sasuke killed itachi, that never happen. I'm not a Sasuke hater but, Sasuke gets lucky with his fights so far. Think about it. Orochimaru: Ill from taking medication. Itachi: Suffered from a disease. Killer Bee: Gotten tired of fighting team taka, so he hid himself in a tail of the beast, lol that was a joke, but seriously if it wasn't for Suigetsu, Jugo, and Karin, Sasuke would have been killed.